Walter Benjamin's posthumously published collection of writings on hashish is a detailed blueprint for a book that was never written--a "truly exceptional book about hashish," as Benjamin describes it in a letter to his friend Gershom Scholem. 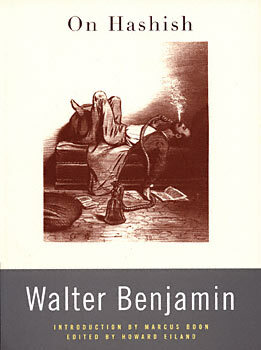 A series of "protocols of drug experiments," written by himself and his co-participants in the years 1927-1934, together with short prose pieces that he published during his lifetime, On Hashish provides a singularly intimate portrait of Benjamin, venturesome as ever at the end of the Weimar Republic and of his unique form of thought. "Benjamin's [hashish] experiments correspond quite precisely to the specific cognitive intentions articulated in his most fully developed philosophical texts, intentions that would find expression above all in the extraordinary Arcades Project. [He perceived] 'how deeply certain powers of intoxication are committed to Reason and its struggle for freedom.' Benjamin accurately saw how in the epoch of the decline and self-destruction of bourgeois society, both 'the more common productive forces of nature' and 'the more remote' forces--the powers of ecstasy--are 'perverted and spoiled.' In the pre-fascist and fascist eras, Benjamin was able to turn such deformation into a medium of experience." "Current research on hashish and other hallucinogens focuses on the mechanisms by which they distort thought and perception. In today's scientific drug journals, the topics are neurons, chemical messengers, and techniques for visualizing cellular energy dynamics. Walter Benjamin's On Hashish reminds us why we are interested in hallucinogens in the first place: they transform individual consciousness. Benjamin's hashish experiments, which he refers to as 'trances,' also remind us that subjective states, even those induced by powerful pharmacological agents, reflect their historical settings as well as their underlying biochemistry. The cultural context for On Hashish includes Marx, the Symbolist poets, Kafka, the emergence of mass culture, and the rise of fascism. The result is a one-of-a-kind fusion of grand ideas, longings for community, and the twists and turns of cannabinoid perception."